While we recommend these services, you can disable any of them by clicking the three-dot browser menu in the upper right corner of the browser and selecting Settings > Show advanced settings > Privacy. The above notwithstanding, you can still use Ghost Browser to browse without having your searches tracked by Google. If you are logged into Google or Gmail and search Google in the same Session, they will be able to track your searching and browsing history. If you search in a different Session, those searches will not be linked. Use a web service to help resolve navigation errors: This is provided by Google and is enabled by default in Ghost Browser. Use a prediction service to help complete searches and URLs typed in the address bar: This is provided by Google and appears in the address bar or the search box in the App Launcher when you enter information. Enabled by default in Ghost Browser. You can disable it completely or just change the default search engine. 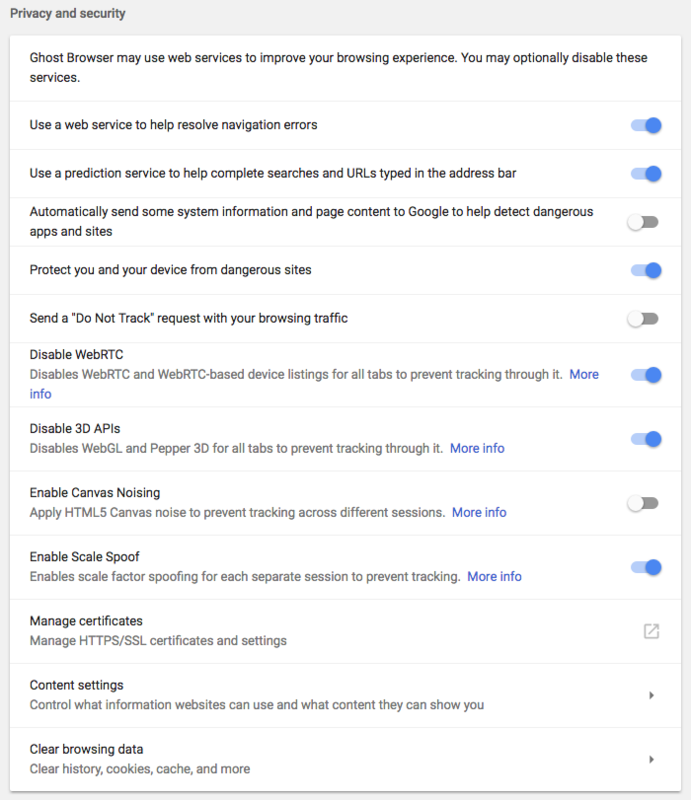 Use a prediction service to load pages more quickly: This option lets websites load faster by using tactics such as browser-initiated DNS pre-fetching, TCP and SSL pre-connection, and pre-rendering of web pages. This is enabled by default in Ghost Browser. Automatically report details of possible security incidents: This option sends an automatic report to Google about possible security incidents. It is disabled by default in Ghost Browser. Use a web service to help resolve spelling errors: This requires an API key to work and is disabled by default in Ghost Browser. Send a ‘Do Not Track’ request with your browsing traffic: This sends a Do Not Track request to any website you visit. If the website has implemented the voluntary Do Not Track functionality on their website, they will not track you. This is disabled by default in Ghost Browser. We also send usage data (link to phone home article) to a third party tool that we use for analyzing usage trends of our software. Your browsing history, URLs visited and your private content like autofill data, Task names and other content you made add are NEVER sent.